Those of you who own a ute know how versatile and tough they can be. They are extremely useful machines, and with so many work related tasks being delegated to the humble ute it’s little wonder that the rivalry inside the ute market is well and truly entrenched. Businesses that provide a service to tow, connect with clients, carry goods and host onsite meetings in the rain/mud liken the ute to an office on wheels. Tough, powerful and stylish, the 2017 Volkswagen Amarok V6 Diesel sets a new benchmark for work utes. VW ute designers haven’t held back on this model. This is the executive ute model, and you’ll see why in a moment. As far as looks go, the 2017 Amarok is slightly more refined with smoothed out edges and tidier lines. It’s not a design that sets the heart rate racing, but it is nice to look at and does the job well. 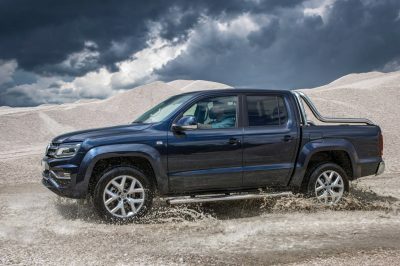 Standing up close to the new Amarok, and one gets the sensation of bigness and boldness more than one might get the same impressions looking at the Amarok from a distance. This V6 Diesel model has nice flared wheel arches, bold alloys, an engine pan skid plate, chrome side rails and deck rails, large mirrors and touches of glossy chrome detailing around the exterior. Take a look under the lid/tarp at the rear, and the loading tray (1222 mm) is huge; and Volkswagen suggest it’s the biggest available in its class this side of a Ford F-250. When you’re comparing eggs with eggs, the Amarok deck is bigger than Hilux, Colorado, Navara and Ranger utes. The VW Amarok V6 Diesel can pack a full size ‘Euro’ pallet on the deck. The tray is wide, and with the four lashing eyes conveniently located around the load space you can easily tie down your motorbike, kayak or firewood onto the deck. A nice touch with the Volkswagen’s rear tray is the light above the rear window that you can switch on to illuminate the deck in the dark. The tailgate has been designed to cope with loads of up to 250 kg, so even your Sumo friends can help load up the Amarok! Solid and reliable engines are a must in the tough work environment you’ll find an Amarok. 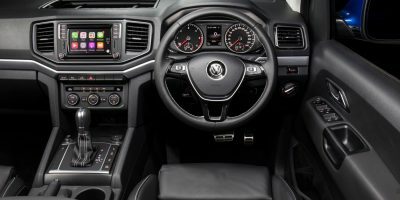 Good TDI diesels have been a Volkswagen specialty for some time now, but as with any torquey turbo-diesel you do need to keep up with the regular service intervals to ensure trouble free motoring. Service these well and they’ll keep going for a very long time. The new VW Amarok V6 Diesel comes with a 3 year/unlimited km warranty for great peace-of-mind motoring. The standard Amarok utes come with the excellent 2.0 TDI engine delivering 132 kW and 400 – 420 Nm of torque putting it on a par with larger engines found in Hilux, Ranger, Navara and Colorado competitors. But put a VW V6 turbo-diesel unit into the Amarok and nothing comes close in its class for sheer power and performance. The latest generation 3.0-litre TDI V6 engine delivers 165 kW (180 kw under boost) of power and a whopping class topping 550 Nm of torque from as low 1500 rpm. One doesn’t usually talk sprint times for diesel utes but with the new Amarok V6 the 0 to 100 km/h dash can be done in less than eight seconds. The overboost function delivers an extra 15 kW of power on top of its class-leading grunt. Linked to Volkswagen’s Diesel power is the 4Motion 40:60/front:rear permanent AWD system with an off-road mode, hill-descent control and rear Torsen diff lock as standard features. All V6 versions boast the really smooth eight-speed automatic, or you can choose the strong six-speed manual unit instead. VW have set out to defy the stereotypical first impressions of a ute being totally utilitarian, practical and rugged with no servings of refinement, luxury and comfort being a part of the overall packaging. Both VW Amarok V6 Diesel models have a resilient toughness wrapped up in a dollop of luxury and refinement. Delivering a nice leather seat environment (Ultimate model) with accented stitching and side bolster support, climbing inside the new Amarok V6 Diesel is a pleasant experience that is perfect for entertaining clients. Interface logic via the centre touchscreen, Voice control and Bluetooth streaming for music and communications make the Amarok V6 Ultimate a moving office that’s set to impress. Getting too stuck-up over owning a new Amarok isn’t worth the effort, but there is some really good kit on-board the V6 models. Two variants are offered in Australia, where the Highline is the base model featuring items like ISOFIX child safety, multi anti-collision braking systems, front/rear parking sensors, a reversing camera, dusk-sensing headlights, rain-sensing wipers, Bi-Xenon headlights with LED DRLs, stainless steel side steps, 18-inch alloys (255/60 tyres), dual-zone climate control, cruise control, a 6.3-inch touchscreen with satellite navigation, Apple CarPlay and Android Auto, digital radio and sleek cloth seats as standard. 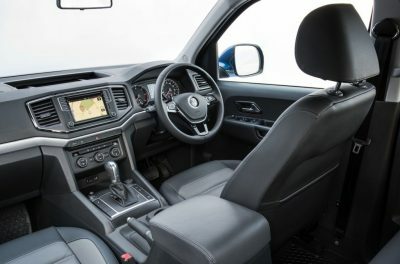 The VW Amarok V6 Diesel Ultimate adds features like Illuminated side steps, 19-inch alloys (255/55 tyres), a colour multi-function digital display driver’s information screen, aluminium pedals, paddle shifters, leather seats, and an Ergo Comfort driver’s seat with 14-way electronic adjustment and heating functions. Out on the road the V6 Diesel is a true performer and will easily cruise at high speed all day long while the driver and passengers enjoy premium comfort. Safety features are all modern and present providing the Amarok ute with an excellent five-star safety rating. A towing capacity of up to 3.0 tonnes makes for lots of options, while equipping the V6 with a tow wiring kit gets you the active trailer sway control feature that is built into the ESC system. This should be on your list of best utes to buy that are available in Australia. The first Amarok utes were a teaser, just bracing you for what was really to come. With a ton of accessories to choose from, you can personalise your new VW Amarok V6 to be just right for you and the job you’ll need it for. 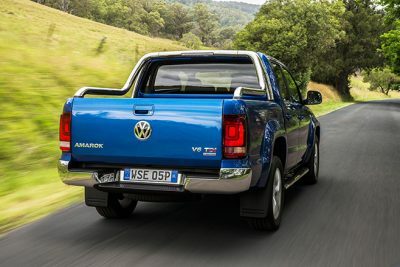 For any more information on the latest Volkswagen Amarok V6 Diesel ute or, for that matter, any other new car, contact one of our friendly consultants on 1300 303 181. If you’d like some fleet discount pricing (yes even for private buyers! ), we can submit vehicle quote requests out to our national network of VW dealers and come back with pricing within 24 hours. Private Fleet – car buying made easy!